Launch 1018 set out just after 8:00 am this morning. I was teamed with FOO (Field Operations Officer) Jennifer Dowling, SST (Senior Survey Technician) Grant Froelich, and ENS Wendy Lewis. We began our day by doing something called a PATCH TEST. This test is done to determine the allowable error of the data that is collected when moving the boat back and forth over a target such a rock just below the water’s surface. The test includes a pitch test, a roll test and a heading test. 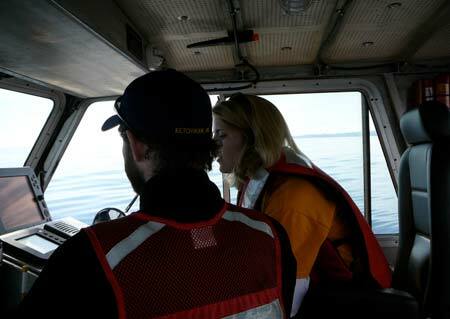 Each test collects information about the boat as it makes its way through the water. I work hard to pull in the CTD which was resting about 150 feet below on the ocean floor. As we passed over the large rock that we were observing under the water, a clear picture of it popped up on the screen in front of us. It was neat to see an underwater picture of a feature that was collected using echo sounding. 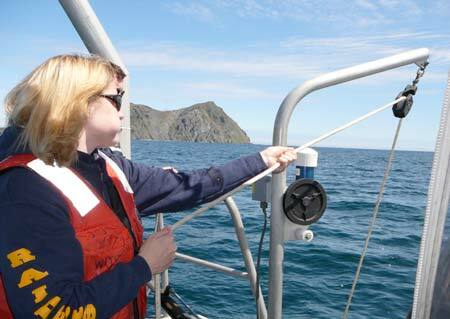 The MBES (multi beam echo sounder) transducer is able to send out hundreds of signals and receive them back to create an accurate picture of things below the water’s surface. It is quite amazing. Midway through the day we returned to the FAIRWEATHER to a picnic lunch on the fantail. This was a fun way to send time bonding with the team I was working with that day. We then set out again for more hydrography work on the SW point of Cape Devine. I was able to do a CTD (conductivity, temperature, depth) cast all by myself. I had carefully watched others deploy the CTD throughout the week and I had assisted on several aspects of the cast, but I was excited to be able to put what I had learned into practice. The CTD has to be turned on for three minutes to warm up, and then it must sit in the water for two minutes just below the surface to properly calibrate. After that it is time to lower it to the bottom of the ocean floor to gather data, followed by quickly pulling it back to the boat. It is definitely fun, but hard work at the same time. The CTD device is by no means light! So today I drove the boat! Ok, really I just sat in the driver’s seat while SST Grant Froelich taught me how he operates the vessel. We weren’t even moving! Today is World Hydrography Day and what an amazing day for it! This is by far my best day here so far! They just keep getting better and better! Absolutely beautiful weather in Alaska today! Clear skies, sun, and warm temperatures made my outlook on the day wonderful! I saw my first whale today! It was amazing. There were two off the bow of our boat during the launch. I only saw a small part of their bodies and their puffs of water from their blowholes, but it was my first sighting and what I had been waiting for! I also captured some amazingly beautiful pictures of two very large bald eagles resting on the navigation light on Andronica Island. Then to top it all off, when we returned from our launch and settled down to eat dinner, someone reported whales directly off the stern of the FAIRWEATHER playing in the Korovin Bay. I snapped some pictures as I watched them surface again and again. I am in awe of the exquisite wildlife that is all around me here in Alaska! 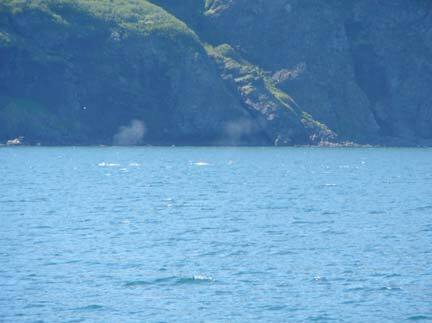 Two whales play in the Korovin Bay, just off the stern of the ship. What a treat! The bald eagles in Alaska are abundant. Unfortunately this wasn’t always the case. The population of bald eagles decreased in the past. Fortunately now the numbers of bald eagles are on the rise again. What chemical has been linked to the decrease in the bald eagle population? What was done about the use of this chemical in order to attempt to raise the numbers of bald eagles again? 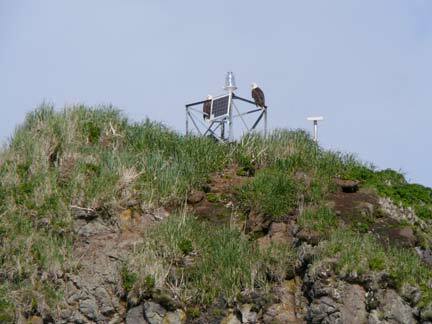 Two bald eagles sit on the top of the navigational light on Andronica Island. A beautiful scene as we took a break from our work! 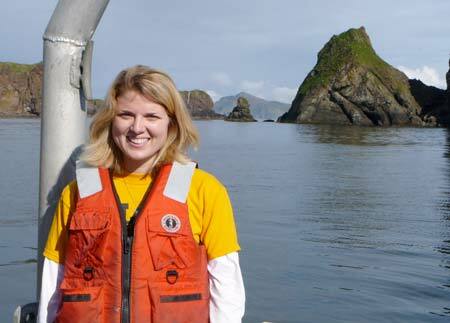 This entry was posted in 2006, Lisa Kercher, NOAA Ocean Service, NOAA Teacher at Sea and tagged Alaska, CTD, eagles, fisheries, Hydrographic survey, navigation, NOAA Ship Fairweather, sonar, whales. Bookmark the permalink.